If you are pregnant, then you are probably wondering whether or not turmeric is good to eat during pregnancy and safe to use. Turmeric is one of those foods that can be both good and bad for you, depending on circumstances. Most foods actually have benefits and side effects and no food is really perfect for everyone. Spices like turmeric hold even greater medicinal properties than most produce and tend to be quite potent in their effects. As such, despite a limited intake, there is a risk that their use during pregnancy could result in side effects for both baby and mother in certain circumstances. Pregnancy is a sensitive period in a woman’s life and a time of great change. The body changes to accommodate bringing new life into the world and this may mean different reactions to otherwise healthy foods and the biologically active elements in them providing benefits. This may include adverse reactions too. As a result, something you could have enjoyed eating before becoming pregnant may become unsafe during pregnancy, especially if consumed in large amounts or every day. When it comes to turmeric and pregnancy, intake, type of turmeric used (dietary source or supplements) and any existing or new medical condition, food sensitivities, intolerances or restrictions are all factors to take into account when looking to understand whether or not it may be safe for you and your baby. It is important to remember that your pregnancy is quite unique and the foods other women may find are good for them may not necessarily be good for you too. So the best possible approach is to do your research to have a good understanding of the subject, then see your doctor and discuss how turmeric may affect you and your baby during pregnancy and what would be the best intake for you. This being said, let’s see how eating turmeric could affect your pregnancy. First of all, what is turmeric? Turmeric (Curcuma longa) is a root vegetable and a culinary spice used to flavor food. It is related to ginger. Its most prominent flavor-giving compounds are curcumin and essential oils. Curcumin is also the main biologically active compound and the primary source of turmeric’s health benefits and side effects. It is extracted from the root and used to make turmeric supplements for more potent health effects. Curcumin is what dictates whether or not turmeric will be good for you during pregnancy. 1) Mild pain relieving properties. Curcumin in turmeric is a powerful natural anti-inflammatory and can help reduce muscle or joint related pregnancy aches and pain, possibly help with headaches. 2) Benefits for morning sickness. Turmeric is from the same family as ginger and has a similar sharp, spicy taste that could help reduce nausea and improve morning sickness. However, its effects are often limited which doesn’t make it a great home remedy for severe morning sickness. 3) No risk of birth defects. Studies show eating turmeric in small amounts does not cause birth defects. It is recommended limit intake to half a teaspoon (roughly 1.5 g), enough to season food. 4) Tonic effects. Turmeric is a rich source of dietary minerals and vitamins such as B vitamins, vitamins E and K, calcium, iron, magnesium, phosphorus, potassium, sodium and zinc. And although you get little nutritional value because you can only eat very little turmeric, it still contributes to a light tonic effect. 5) Skin benefits (external use). Turmeric can help clear skin, combat pregnancy acne and may help with pregnancy hyperpigmentation (melasma). The skin lightening effects of turmeric are enhanced by using it together with lemon juice and light colored honeys in natural, home-made face masks. However, remember that turmeric, lemon juice and even honeys (choose your favorite honey) can trigger skin allergic reactions so make sure your skin tolerates such products well. 6) Bad for hemorrhoids. Most of the health benefits of turmeric are a result of its sharp-tasting compounds. But these compounds are also irritants at origin and eating too much turmeric can cause hemorrhoids flare ups during pregnancy. Ginger, pepper, wasabi, horseradish and hot peppers are also bad foods for hemorrhoids during pregnancy and in general. 7) Disruptive of digestive health: Eating too much turmeric during pregnancy can cause stomach upset, diarrhea, heartburn, acid reflux or worsen an existing gastritis. Some people are quite sensitive and even small amounts could trigger side effects (read more about turmeric side effects). 8) Blood thinner, may cause bleeding. Turmeric is known to decrease blood clotting which could be bad for pregnant women, causing bleeding, possibly a miscarriage or worse. It is recommended to discontinue use at least one month before birth. 9) May cause uterine contractions and miscarriage. Large amounts of turmeric from food or turmeric or curcumin supplements are unsafe during pregnancy and can cause uterine contractions, potentially leading to a miscarriage. 10) Potential estrogenic effects. Although research is conflicting, there are studies that show turmeric has estrogenic properties. Since hormone levels fluctuate during pregnancy causing a hormonal imbalance, eating foods that further disrupt hormone balance could negatively impact your health (example: estrogen dependent cancers). 11) Risk of heavy metals contamination. There have been reports of turmeric products, usually ground turmeric, but also supplements being contaminated with heavy metals (lead) or containing toxic dyes that could be harmful for pregnant women and anyone in general. The safest choices are to either get certified turmeric products or fresh turmeric root to season food. 12) Bad for gallbladder problems and diabetes. Turmeric has been shown to worsen gallbladder problems and lower blood sugar levels in diabetics. If you are suffering from either gallbladder problems or diabetes, including gestational diabetes, it is safest to avoid any food or supplement that could present any health risks for you. 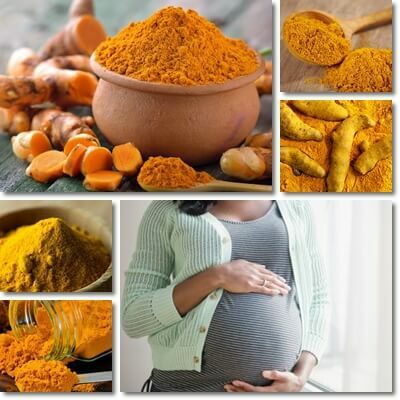 1) Talk to your doctor first about eating turmeric during pregnancy. If your doctor advises against it, it is best to avoid it in any form. 2) If you doctor allows you to eat turmeric, eat it in small amounts. General recommendation: half a teaspoon (1.5 g of turmeric powder), preferably not every day. But it’s always best to ask your doctor how much you can eat safely. 3) Avoid turmeric supplements during pregnancy because their effects are too strong and may elicit side effects for you and the baby. 4) Fresh turmeric root is preferable over dried, powdered turmeric. Powder turmeric can potentially be contaminated with heavy metals such as lead (read more about heavy metal contamination) or contain toxic dyes. Conclusion. When consumed in limited amounts, occasionally, and only after having consulted your doctor about whether it is safe for you or not, turmeric may be used during pregnancy. Intake should be restricted to very small amounts (example: half a teaspoon of ground turmeric) and daily use avoided. If you feel it is not good for you, experience side effects such as stomach upset, diarrhea, abdominal cramps, heartburn, acid reflux, skin rashes or others, stop using turmeric and see your doctor.